Today our topic is IIFYM — If It Fits Your Macros. What is IIFYM? IIFYM is an eating strategy designed to keep you in your best possible shape year round. It has recently gained in popularity among physique competitors who don't want to constantly live on a restrictive diet plan. While IIFYM has some major names backing it there are also many in the industry who are picking it apart. Let's have a look at this and see what we conclude about IIFYM. 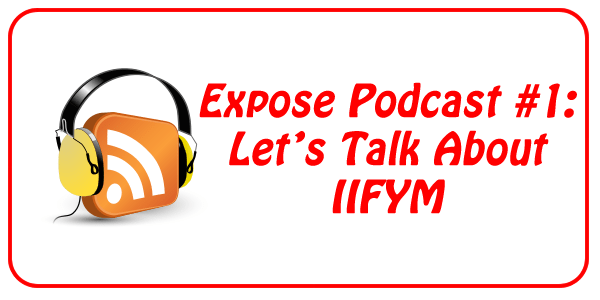 As I did my research for this episode I came across a lot of things I know do not define IIFYM, yet they attempt to do so over and over. It is definitely a heated topic and one that probably will be for quite some time. This approach requires a change in thinking and so many people are not ready to change their thinking, especially when it comes to their way of eating. On one side of this discussion is the clean eating crowd. This group claims you need to focus on what you eat and to some extent, how much of it you eat. They claim their way works because the food they eat is “clean” and that by watching their caloric intake they are able to take the fat off and keep it off. The clean eating crowd looks at IIFYM and claims it is about how much you eat with no regard to food quality. So what really is the story with IIFYM? Basically it isn't much different from the clean eating crowd at all. It is a way of counting calories because it actually tracks your macronutrients which translates directly into calories. Confused by that? Don't be! One gram of protein or one gram of carbohydrates is 4 calories. One gram of fat is 9 calories. Thus, via the macronutrients, IIFYM counts your calories automatically. You might now be wondering where the controversy is. If both crowds seemingly believe the same thing where is the problem? The short answer is that it definitely works. But why does it work? When you are trying to lose weight and/or fat the calories you take in must be less than the calories you put out. In the strictest sense, while trying to lose weight and/or fat, a calorie is a calorie. The source of the calorie truly is irrelevant. However, in terms of body composition, macronutrients begin to matter a great deal. You will need to take in an ample amount of protein to maintain muscle. You will need an ample amount of carbohydrates to maintain training intensity. The right amount of healthy fats plays a huge role in hormone synthesis. It is at this point that we can understand why tracking your macronutrients is the key. If you hit your macronutrient numbers you are going to hit your calorie goal as well. It is just that simple. So the clean eating crowd is completely wrong, right? You can eat whatever you want and as long as you hit your macronutrient numbers you're going to lose weight, right? We just said that, didn't we? Well hold on just a second because I am about to throw you a curve ball. Eating junk food to get shredded is idiotic. The food we put into our bodies provides us with many vitamins and minerals that assist the physiological functions of the body itself. Candy and junk food are very deficient when it comes to micronutrients. These are essential to a healthy functioning body. So, this is where the clean eating crowd has it right. Health is more important than how you look. I will now suggest that merging the mindset of the two crowds is the correct answer in the long run. I would like to suggest that you can implement the principles of IIFYM in the following manner and be very happy in the end with your results from both an aesthetic and health standpoint. Get 80% of your calories from a healthy source that you actually like. By “healthy” I mean micronutrient dense. This addresses one problem people have when trying to stick to the clean eating group's approach–they get tired of chicken and vegetables all the time and one taste of something savory sends them off the wagon. If you want steak instead of chicken, merely adjust for the fat content. If you want whole fat Greek yogurt, adjust the other fats you intake that day. Don't be afraid to eat some small indulgences. As long as those indulgences work into your macros for the day you will not derail your progress. You want some chocolate? That's great! Just fit it into your macronutrient numbers for the day and all is good. Adjust your meal timing if necessary. So many people love food that is calorie dense. If that is you, don't be afraid to eat less meals. Your body won't slow its metabolism down by eating 3 meals instead of 5. I personally prefer smaller, more frequent meals, but that's me. Follow the Experiment of One when it comes to this and you are going to be just fine. Like everything else in physique transformation, the Experiment of One is an essential tool. Don't try to force the approach of others to fit your own needs. It just isn't going to happen. Your body will tell you (or perhaps show you) what works best for it. Follow along and you will have great success. Hopefully I have taken away some of the confusion surrounding this debate. Simply put, focus on your health before all other things. Don't use IIFYM as an excuse to eat horrible junk food non-stop. At the same time, use the flexibility built in to eat something savory every so often. It will keep you on track. Thanks for your time and I look forward to the next episode of Expose Podcast.